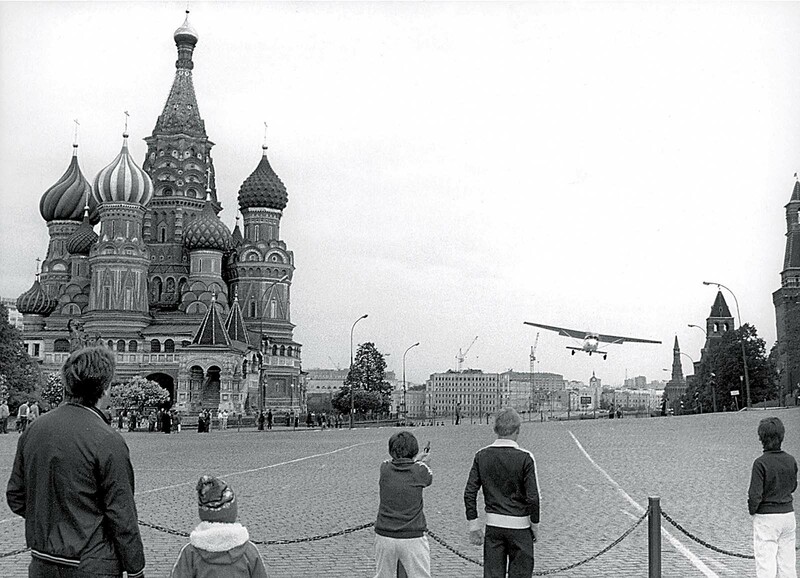 Rust’s Cessna 172, resting near Red Square some time after his landing. Rust is standing on the right in the photo, wearing colored overalls. It all began in May of 1987. Mathias Rust was fed up with the Cold War tension between the United States and the Soviet Union so he planned to create an “imaginary bridge” to the East. He left Uetersen in his rented Reims Cessna F172P D-ECJB, which was modified by removing some of the seats and replacing them with auxiliary fuel tanks. He spent the next two weeks traveling across Northern Europe, visiting the Faroe islands, spending a week in Iceland, and then visiting Bergen on his way back. He was later quoted as saying that he had the idea of attempting to reach Moscow even before the departure, and he saw the trip to Iceland (where he visited Hofdi House, the site of unsuccessful talks between the United States and the Soviet Union in October 1986) as a way to test his piloting skills. In the morning of 28 May 1987, Rust refueled at Helsinki-Malmi Airport. He told air traffic control that he was going to Stockholm, and took off at 12:21 p.m. However, immediately after his final communication with traffic control he turned his plane to the east. 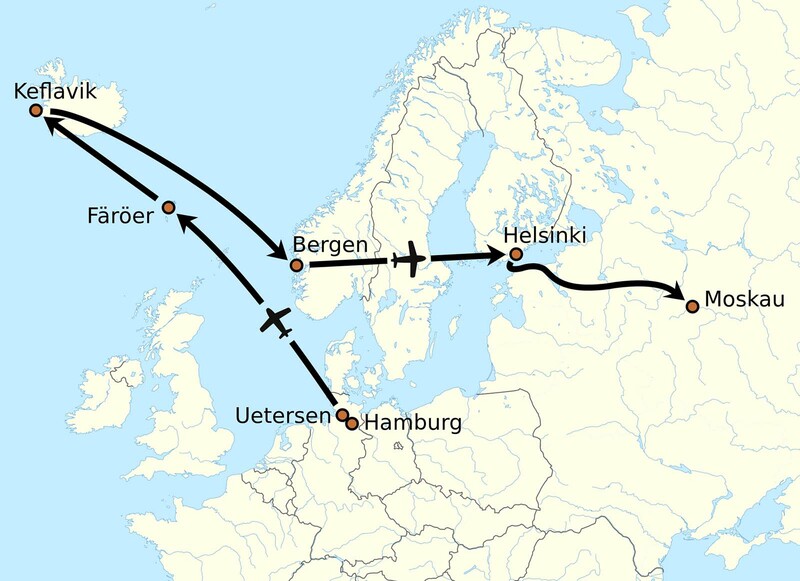 Air controllers tried to contact him as he was moving around the busy Helsinki–Moscow route, but Rust turned off all communications equipment aboard. Rust crossed the Baltic coastline over Estonia and turned towards Moscow. At 14:29 he appeared on Soviet Air Defense (PVO) radar; the “object” that did not answer the call sign of “friend or foe”; it was assigned a number 8255. Three missile battalions were set in alertness, but there was no order to defeat the object. Two interceptors were sent to investigate and at 14:48 near the city of Gdov one of the pilots observed a white sport plane and asked for permission to engage, but was denied. 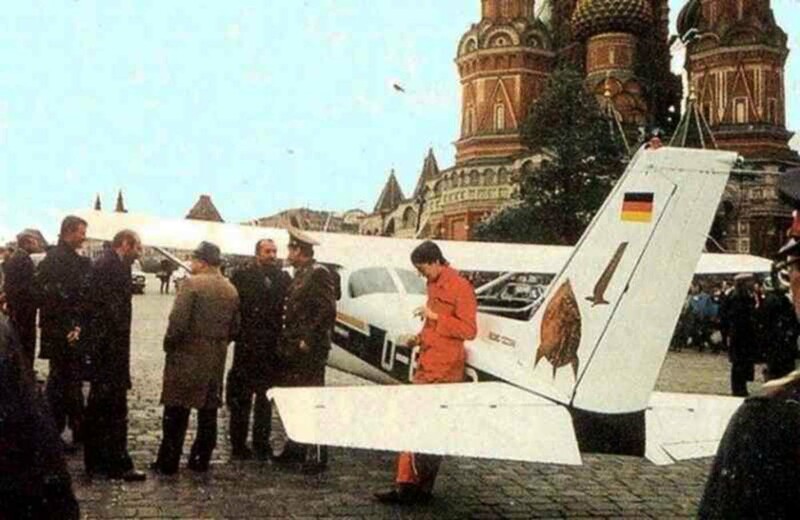 Mathias Rust’s plane ready to land on Red Square. Air defense re-established contact with Rust’s plane several times but confusion followed all of these events. Luckily for Rust that day the local air regiment near Pskov was on maneuvers and, due to inexperienced pilots’ tendency to forget correct IFF designator settings (foe or friendly settings), local control officers assigned all traffic in the area friendly status, including Rust. Near Torzhok there was a similar situation, as increased air traffic was created by a rescue effort for an air crash the previous day. Rust, flying a slow propeller-driven aircraft, was confused with one of the helicopters taking part in the rescue. Around 7:00 p.m. Rust appeared above downtown Moscow. He had initially intended to land in the Kremlin, but changed his mind: he reasoned that landing inside, hidden by the Kremlin walls, would have allowed the KGB to simply arrest him and deny the incident. Therefore, he changed his landing spot to Red Square. Heavy pedestrian traffic did not allow him to land there either, so after circling about the square one more time, he was able to land on a bridge by St. Basil’s Cathedral. After taxiing past the cathedral he stopped about 100 metres (330 ft) from the square, where he was greeted by curious passersby and was asked for autographs. When asked where he was from, he replied “Germany” making the bystanders think he was from East Germany; but when he said West Germany, they were surprised. Rust was arrested two hours later. He was charged with several violations, the most serious being that he had illegally entered Soviet airspace. Rust argued that he was merely trying to promote world peace. He carried with him copies of a plan he had developed for a worldwide democracy, which he referred to as “Iagonia”. 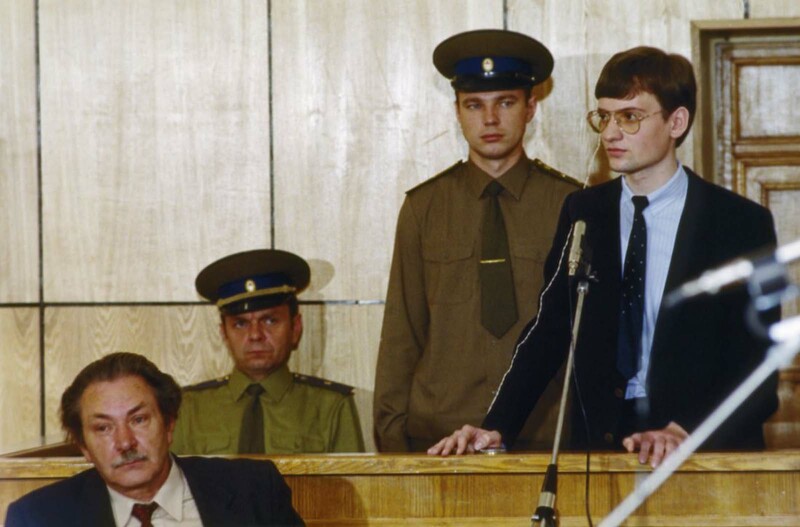 Rust’s trial began in Moscow on 2 September 1987. He was sentenced to four years in a general-regime labor camp for hooliganism, for disregard of aviation laws, and for breaching the Soviet border. Two months later, Reagan and Gorbachev agreed to sign a treaty to eliminate intermediate-range nuclear weapons in Europe, and the Supreme Soviet ordered Rust to be released in August 1988 as a goodwill gesture to the West. After his release, Rust enjoyed a short period of fame before he retreated from the public eye and became involved with several utopian and religious groups. Mathias Rust on trial for invading Soviet air space. William E. Odom, former director of the U.S. National Security Agency and author of The Collapse of the Soviet Military, says that Rust’s flight irreparably damaged the reputation of the Soviet military. This enabled Gorbachev to remove many of the strongest opponents to his reforms. Minister of Defense Sergei Sokolov and the head of the Soviet Air Defence Forces Alexander Koldunov were dismissed along with hundreds of other officers. This was the biggest turnover in the Soviet military since Stalin’s purges 50 years earlier. Rust’s rented Reims Cessna F172P (serial # F17202087), registered D-ECJB, was sold to Japan where it was exhibited for several years. In 2008 it was returned to Germany and was placed in the Deutsches Technikmuseum in Berlin. So in the end, he did wind up helping to end the Cold War. Just not in the way he intended.